Visit PHM this summer and enjoy some free, Family Friendly fun! Make Your Mark every Wednesday afternoon in the school holidays and express yourself through music, art and storytelling. Inspired by our exhibition Represent! Voices 100 Years On, find new ways to use your voice. 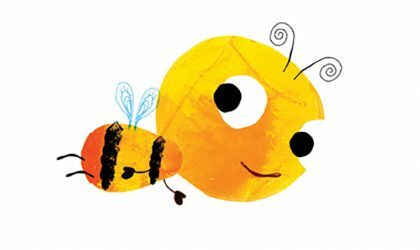 Bring your very little ones to meet Little Bee in a fun, interactive story session with puppets, song, dance and a craft activity. As the current holder of the Kids in Museums Family Friendly Museum of the Year Award, the museum is Family Friendly throughout with hands-on stuff in every gallery, five-a-day picnic bags at The Left Bank cafe bar, or you can enjoy your lunch in our picnic area! Visiting the museum over summer? Don’t miss the latest community exhibitions, part of our year long programme exploring the past, present and future of representation. 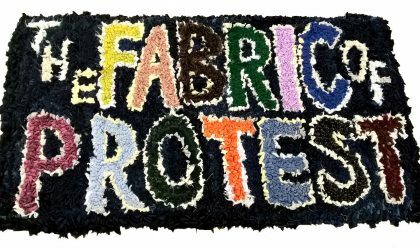 On display until Sunday 9 September, The Fabric of Protest exhibition gives voice to ideas of representation, explored by the monthly Fabric of Protest workshop participants, showcasing printed, crocheted and embroidered textiles. On display until Sunday 23 September, The women who said ‘yes’! tells the extraordinary stories of the 17 women who stood for parliament in the 1918 general election. Friday 3 August to Sunday 2 September, Tape Letters shines light on the use of cassette tapes as an unusual but practical method for those families separated by migration to stay in touch. PHM is delighted to be a North West Cultural Education Award winner in partnership with Manchester Secondary Pupil Referral Unit, for the bold, colourful and powerful piece of artwork Who Represents Me featuring as part of the Represent! Voices 100 Years On exhibition. Looking for your next summer read? PHM’s shop is newly stocked with a range of books covering topics from representation and protest to fashion and technology. Follow @phmshop on Instagram to stay up to date as new titles hit the shelves. Ideas worth fighting for have often been debated under the cover of darkness, in secret and away from prying eyes. Every second Thursday each month our galleries are open all evening for you to explore, with a regular programme of exciting and quirky happenings. To mark the 199th anniversary of the Peterloo Massacre in Manchester, come along on Thursday 9 August and meet the activists who champion today’s ideas worth fighting for. 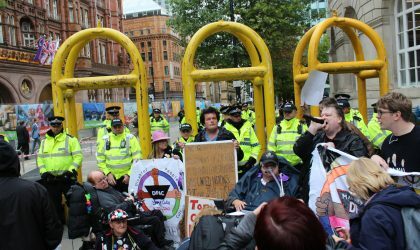 Meet campaign groups from across Greater Manchester and find out where and when they hold their meetings and protests, and what campaigns you can get involved in. This event will be presented in partnership with Manchester Histories, as a chance to find out how you can also shape the bicentenary commemorations of the Peterloo Massacre in 2019. Wild in Art and Manchester City Council have brought Manchester’s communities together for Bee in the City, a stunning public art trail of over 200 individually designed bee sculptures. For the Little Bee trail over 30,000 school children and groups from across Greater Manchester designed their own bee sculptures; search for five of them on your bee hunt around PHM! Crafted by regional professional and emerging artists, the Big Bee trail is also weaving its way across the city until Sunday 23 September. 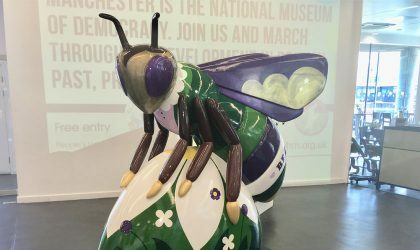 The museum is buzzing to be hosting a very special purple, white and green Big Bee sponsored by UNISON Manchester and UNISON North West, going by the name of Sylvia Pankhurst – don’t miss her!